eMachines is the budget computer brand from Gateway. eMachinese E4038 is a digital entertainment computer that runs on Microsoft Windows® XP Media Center Edition 2005, and powered with Intel Pentium 4 processor 524 with HT Technology, NVIDIA GeForce 6200 graphics card with 256MB TurboCache memory, plus TV tuner and media center remote control and other standard accessories such as DVD±RW, 8-in-1 digital media manager and reader, modem, 6-channel (5.1) AC’97 and 10/100Mbps Ethernet LAN. ComputerAct!ve reviewed eMachines E4038 and concluded that when looked at in the round, eMachines has built a fair computer, without being exciting. At the price, perhaps it’s unreasonable to expect stronger performance at the graphics end, but the analogue TV tuner looks more a cost saving option than a technical choice. 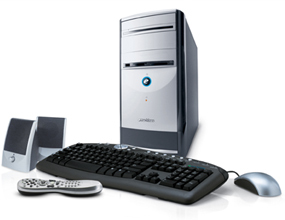 However, add £150 for a 17in LCD monitor and you have a good, up-to-date PC, which also functions well as a secondary TV or basic personal video recorder.